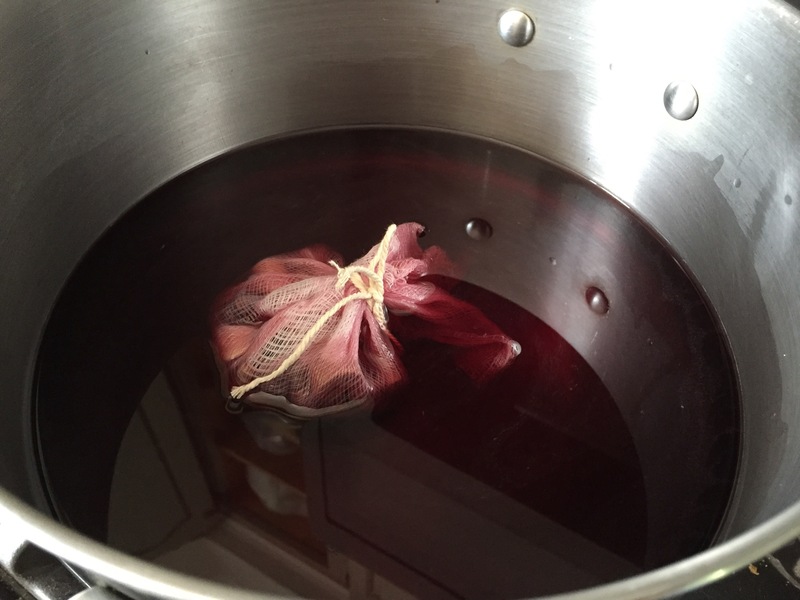 I’m finally nearing the end of my huge harvest of pears but found one more recipe I wanted to try: Pears in Red Wine. 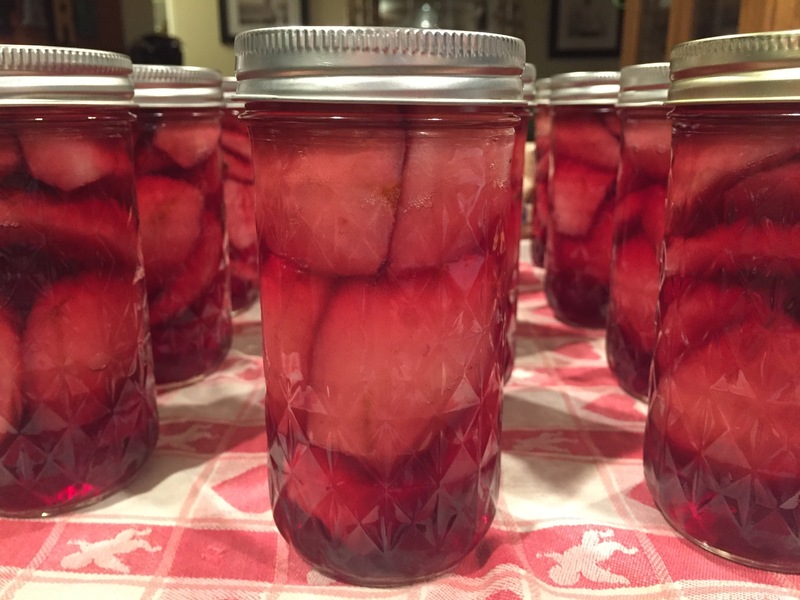 This one comes from my favorite canning cookbook: Canning for a New Generation by Liana Krissoff. To begin, I set my canning pot on the stove to boil and sanitized my jars in the dishwasher. I weighed out 3-1/2 pounds of ripe but firm pears. 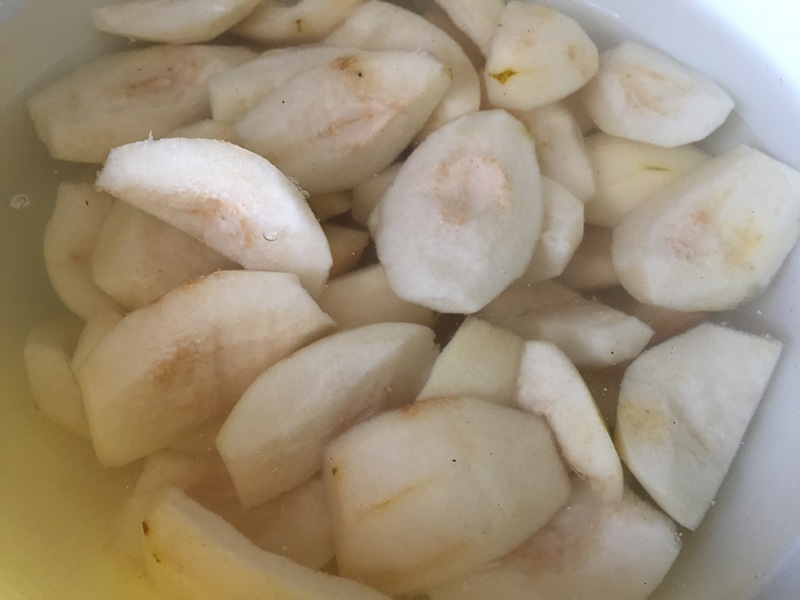 She says to use seckel or fiorella pears. I used the ones from my tree. I peeled, cored and quartered them, dropping them into a bowl of cold water and lemon juice (half a lemon juiced). I set my prepared pears aside. Next, I made a spice bag from a piece of cheesecloth. 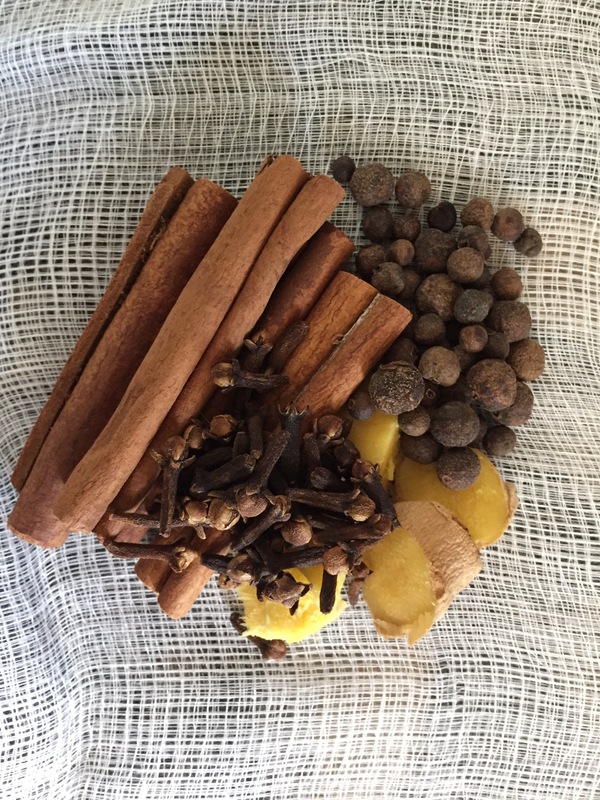 Inside it, I put 4 big pieces of fresh ginger, 4 cinnamon sticks, 2 teaspoons of whole cloves and 2 teaspoons of while allspice. Aren’t the spices beautiful? Tie it up with a pieces of cotton twine and wa-la: spice bag! 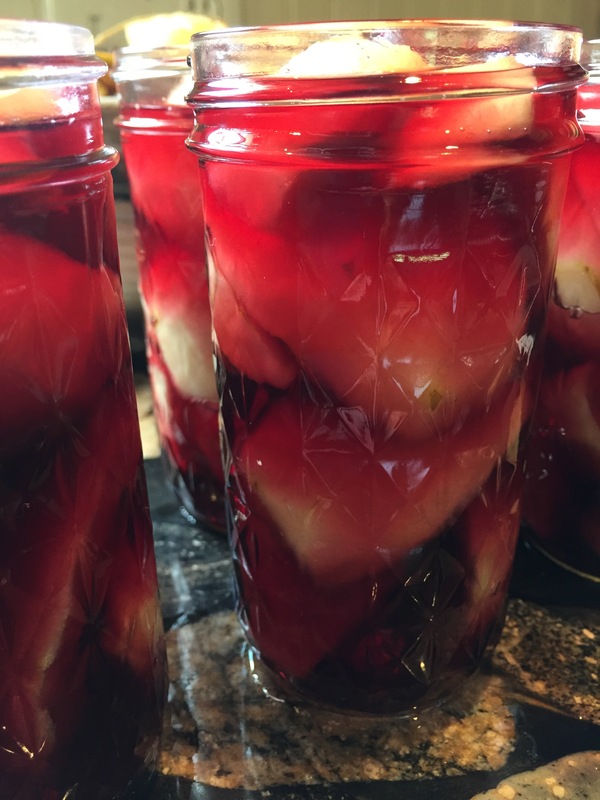 In a large canning pot, pour in 1-1/2 cups of sugar, 1 cup of wine, and 1 cup of water. Bring it to a boil over high heat, stirring to dissolve the sugar. Add the spice bag once the sugar is dissolved. As it reaches a boil, lower the heat to a simmer and cook for 10 minutes. Then discard the spices (or I saved mine and used them to make a second batch). 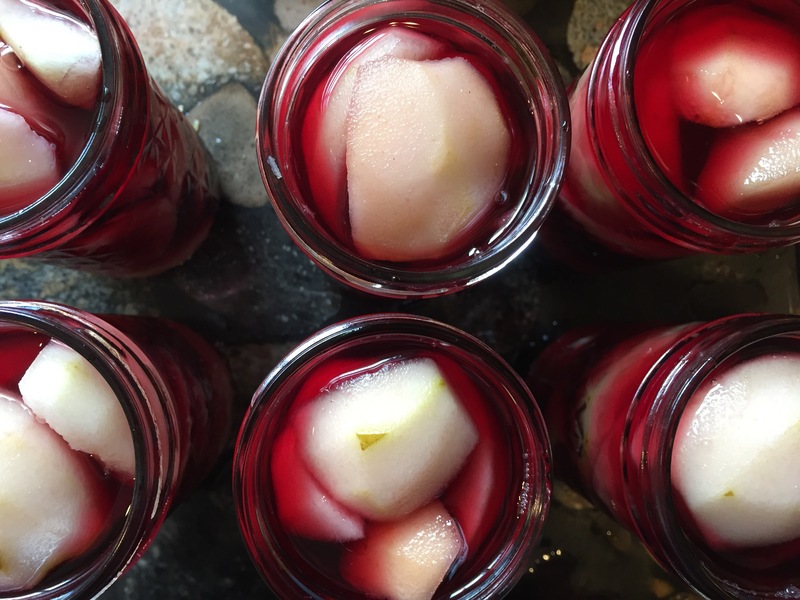 Fill your jars with pears, leaving an inch of headspace at the top. Pour the hot syrup in over top, leaving 1/2 inch headspace. Use a chopstick to tap out any excess air bubbles. 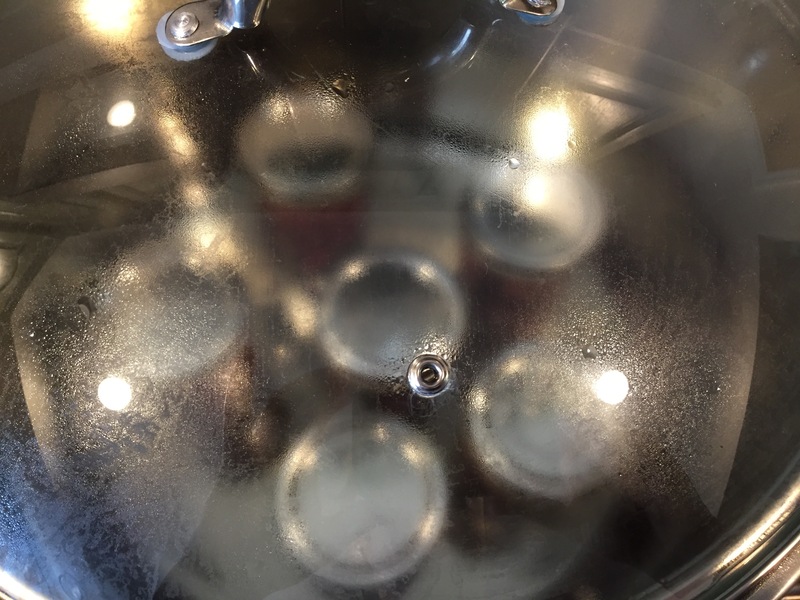 Wipe the rims, apply lids and bands and process in your water bath canner for 15 minutes.